Culms ± stout, 50–100 cm high, 2.5–5 mm diam. Leaves flat, erect, scabrous, about as long as inflorescence; ligule narrow, papery; sheaths grey-brown, often pinkish above, dull. Inflorescence long, narrow, erect to ascending, 50–70 cm long, with 5–9 nodes. Spikelets 2-flowered. 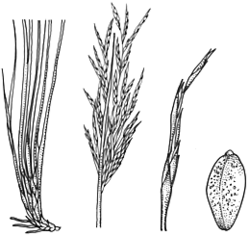 Glumes 5–7, uppermost 2 or 3 much shorter and broader and with erose or fimbriate upper margin, dark grey-brown to blackish, glabrous or scaberulous, lower glumes with acuminate to retuse apex. Stamens 3; anthers 1.7–2 mm long excluding apical appendage 0.1–0.2 mm long. Style 3-fid. Nut obovoid to ellipsoid, obscurely trigonous, 1.5–2.0 mm long, 1.0–1.3 mm diam., reticulate, shining, straw-coloured to dark brown with whitish outer layer. 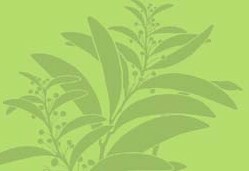 Distribution and occurrence: Grows in eucalypt woodland or sclerophyll forest, often on hillsides in sandy soil in coastal areas south from Bulahdelah area.